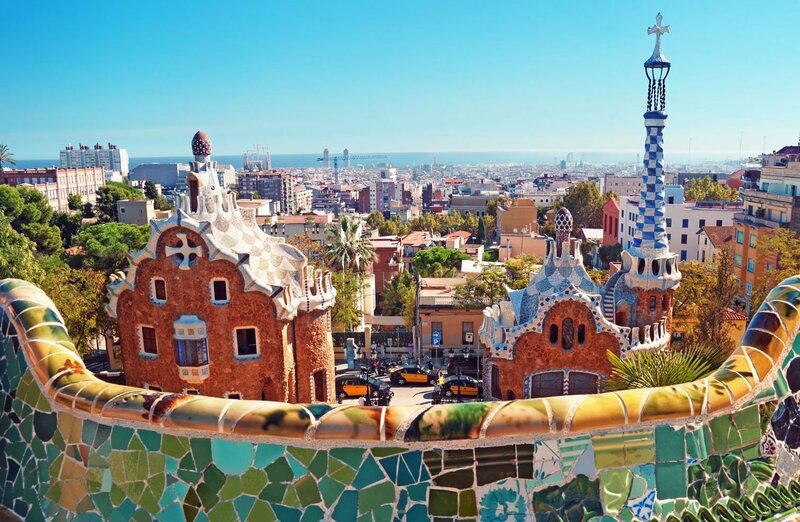 The gastronomical choice in Barcelona is enormous. 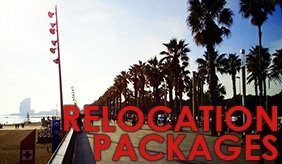 Here you will find everything from the typical local Catalan and Spanish restaurants to the most exotic ones, such as Thai, Hindu, Japanese and much more! Turron: For those moving to Barcelona with a sweet tooth, the Crema Catalana is very similar to Creme Brulee, but a little sweeter. 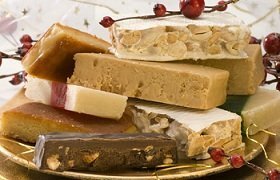 In addition to that, Turron (or nougat) is also a typical confection, made of honey, sugar and egg white. It is more typically consumed around Christmas-time, although usually available throughout the year in most supermarkets. 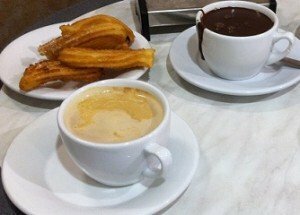 Churros : Another very famous part of Spanish cuisine is Churros. Usually eaten for breakfast, this Spanish doughnut is essentially a fried-dough pastry, which is served with thick warm chocolate. History is divided over where the churros originated from, since the Spanish like to believe that Spanish shepherds invented it, and the Portuguese like to believe that they brought it to Europe from China! 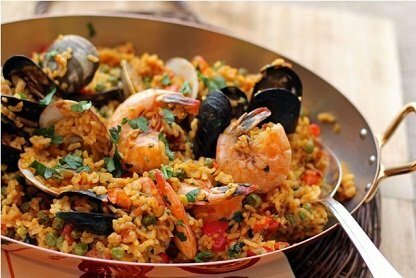 Paella: If a foreigner is asked what they know about Spanish cuisine, this is the most common answer – Paella : a rice dish, made of meat (chicken, pork etc), vegetables and spices, all mixed in a special pan and cooked slowly over low heat. There are different varieties of course, some of which are usually cooked with seafood and on occasion black rice (dyed black with squid ink) Paella originated in Valencia in the South of Catalunya. 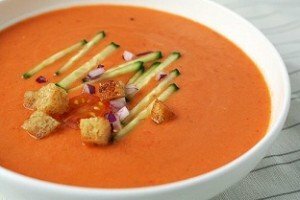 Gazpacho : A very popular vegetable soup made of tomatoes and usually served cold. The ingredients usually include tomatoes, cucumber, pepper, onion, garlic and some spices. Many people swear by this as the most effective hangover cure. 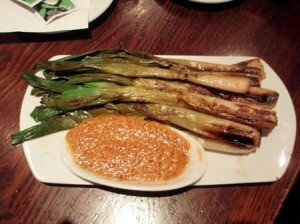 In most restaurants this popular dish can be found as a first course (primer plato) and is especially popular during the hot summer months. 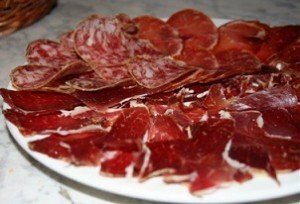 Cocas: Cocas are very popular in Cataluña and in several other regions of Spain. They are made of dough as a basis and then depending on the preferences they can be sweet or savory. The sweet ones are usually made with sugar and eggs and then given different toppings such as strawberries or other fruits, chocolate etc. 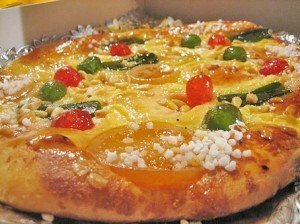 The savory ones are made of vegetables, meat or fish. 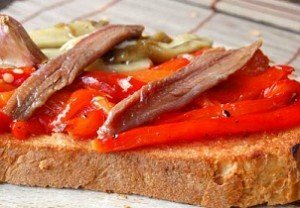 Escalivada : A typical Catalan dish made of grilled vegetables, such as tomatoes, onions, peppers and eggplant with olive oil and salt. Usually the dish is combined with bread and on occasion with sardines. The word “escalivar” literally means “cooked in hot ashes”, after which the vegetables are peeled and sliced in strips and the seeds are removed. 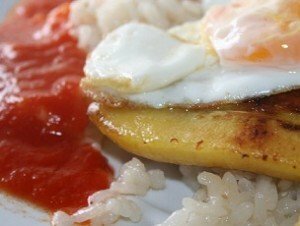 Arroz a la cubana : An authentic Spanish dish that consists of rice, tomato sauce and a fried egg. It has also become popular in the Philippines (which was colonized by Spain at one point) as well as in Peru. Occasionally it is also served with a fried banana, although the Philippine version contains ground beef, onions, carrots, potatoes. garlic and white rice, while the Peruvian version can also be made with a fried hot dog in addition to the fried banana. Pinchos : Pinchos are tapas that originated from the Basque country, but remain popular in many parts of Spain. 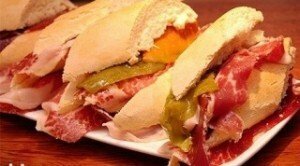 In Barcelona you can find several Basque bars where pinchos are served. 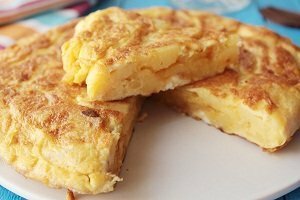 It is basically a piece of bread with a toothpick “pinched” in the middle, combined with any other ingredient on top of the bread such as fish, vegetables, tortilla or croquetas. In some bars, you order what you like, keep the toothpicks and pay for every toothpick instead of keep a bill!